Do you love family game nights? Or, would you love to start having family game nights? We are happy to bring you another great giveaway sponsored by Hasbro! Where will your choices take you? You made it through high school, so now what's next? Go to college or start a career -it's your choice. Think the family life is for you? Take that path and see how many kids you'll have! Will you venture down the risky road where fortunes can be won... and lost? Do whatever it takes to retire in style with the most wealth at the end of the game. Spin the wheel of fate and take a drive along the twisting roads families have enjoyed for more than 50 years! Do good deeds as you go through the game to earn Life Tiles and more money down the road! 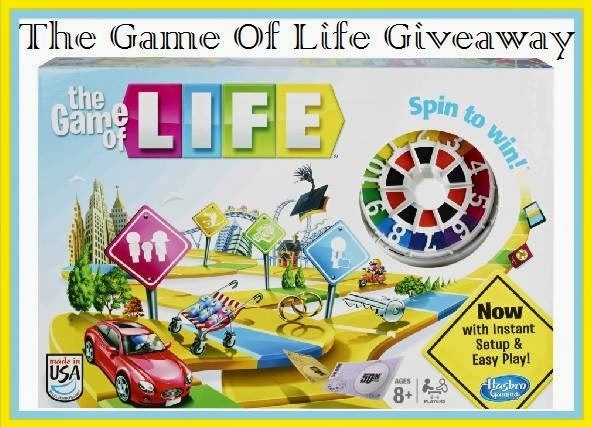 Thanks to Hasbro, one reader will win this amazing new Game of Life board game. The giveaway is open to US Residents, ages 18+ years of age. Simply follow the Rafflecopter form below for your chance to win. The Giveaway ends on 2/17/14. Limit one entrant per household. We love monopoly, but I have been really wanting to play life! I hope I win! Love playing Life, Monopoly, Scrabble, SkipBo, Uno... Many more. Thanks for this great giveaway! All of them we love board games here!